My partner and I love to go on little mini-breaks, we have been on several over the past year and this mini-break is our third with Sykes Cottages (read my other reviews of Church View and Bryn Dyfro). 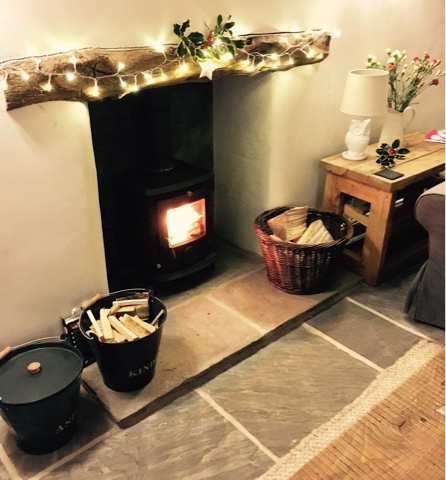 I used to work for Sykes Cottages so I know that their cottages are of a great standard, so while browsing their website I picked a cosy little cottage, Ivy Cottage, in the heart of the Yorkshire town of Settle for mine and Rob's anniversary. While I was looking for somewhere, before picking Ivy Cottage, I had some things that I needed wanted the cottage to have.....it had to have a wood-burner, comfy looking sofas, a nice big kitchen to cook in, a decent size TV and close to local amenities so we could have the option to go out for meals if we wanted and Ivy Cottage did not disappoint us! 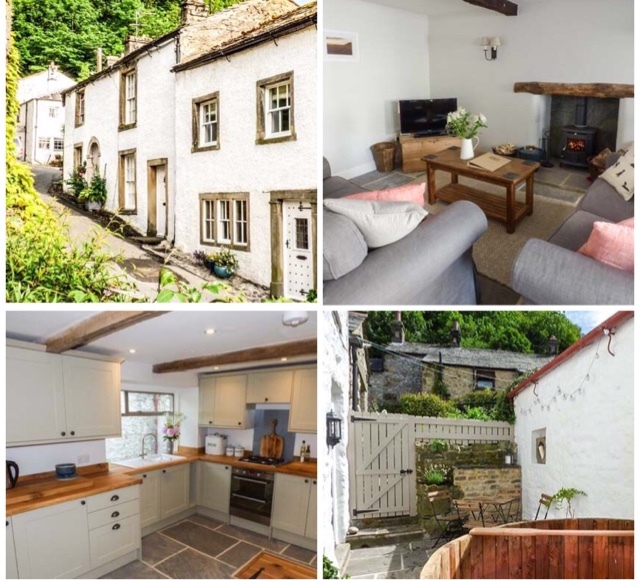 "This first-class Grade II listed cottage is situated in the centre of the popular market town of Settle, in the heart of the Yorkshire Dales. This property has been expertly renovated to provide luxury accommodation, exuding style and character throughout and tastefully showcasing original features such as beams and the traditional windows." Before we arrived the owner, Lianne, emailed us with everything we needed to know about the cottage which made our arrival super simple and hassle-free! The cottage was exactly as we expected, if not better! 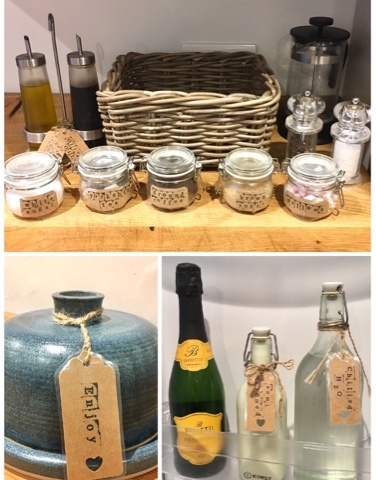 Lianne has ensured this cottage is of the highest standard and she had left us some much appreciated additions to make it homely and welcoming, such as mini kilner jars of tea, filtered coffee, hot chocolate PLUS mini-marshmallows (I was extremely happy about this), cake and a bottle of prosecco! What a welcome! 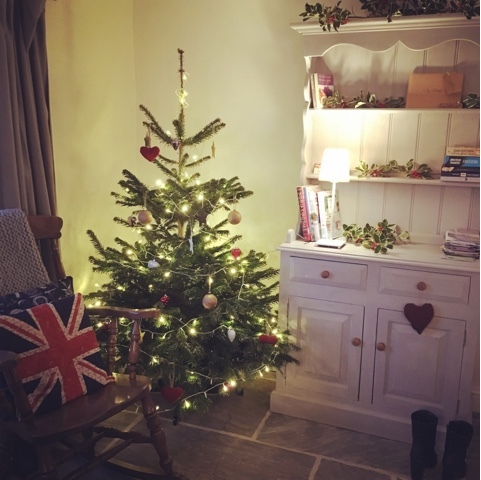 Lianne had also decorated the cottage for Christmas and the decorations were just as pretty as the decor in the rest of the house! As expected it's cold in December so we quickly turned the heating on and within an hour or so the amazing underfloor heating kicked in and we felt extremely cosy and relaxed! There was another big plus to this cottage, a wood fired hot tub, I had never used one before and neither had Rob so it took us a while to get it going but once we had it was definitely worth it. Ivy Cottage sleeps 5 people in 3 comfortably sized bedrooms (two doubles and one single) and it cost us £395.00 for 3 nights, which is very good value, for 5 people it's £26 per person per night! We paid this for two of us which we still think is good value as for a decent hotel room you would pay £100+ per night and that's just a room, with a cottage you have the flexibility of having an entire house and privacy. I haven't really mentioned the location as we didn't leave the cottage much - it was too cosy - however when we did leave the cottage we walked around the market square to get our bearings and all of the local amenities were right on our doorstep, several pubs, shops, takeaways and cafes all within a few minutes walk. Settle is nestled in the countryside so there are several walks straight from the doorstep, but we didn't do much walking apart from to get food supplies, it is however a very scenic and pretty place to visit. We have now got home fully relaxed and ready for the festive period. I would highly recommend Ivy Cottage or even browsing Sykes Cottages for any holiday, especially Winter Breaks as the value for money is fantastic. Have you ever been on a cottage holiday?